I was honored to be showing at December 2018's exhibition sponsored by the Jewish Art Salon, titled ON THE CONSEQUENCES OF HATE SPEECH. It was on view from December 5 to January 18, 2019 at the Manny Cantor Center, NYC. Writer and critic Joan Baum wrote a review of this and other work of mine in the Jan 22 edition of The Independent. “Hope’s abstracts are beautiful tonal compositions, suffusions of red, coral, pink, purple, white, orange, yellow; circles that shade, in spots, into contrasting darker pigment. Patterns of identical six-bead circular designs interlock like a chain or necklace, but on closer inspection, the blurry word “kafir” emerges and recedes, depending on viewing distance and light.” Thanks Joan. Further details are available here. Commentary below. 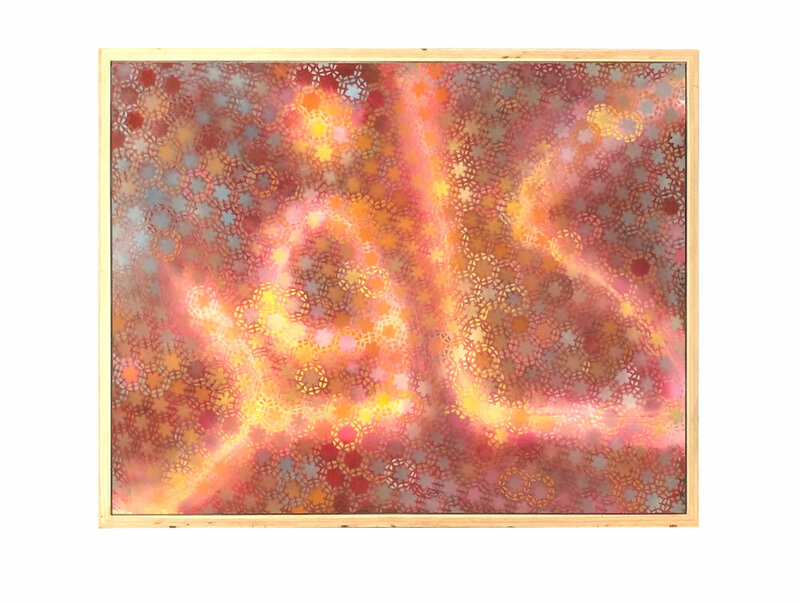 “(Kafir I)” and “(Kafir II)” are parts of a series of works exploring the dynamics of language in belief systems. The word “Kafir” is the Arabic word for “unbeliever,” often translated as “infidel”, (from the root K-F-R "to cover”). Islamic traders used this epithet to denote the Sub-Saharan (non-Muslim) Africans they engaged and exchanged with. It was later picked up by white Afrikaners and became the South African N-word. It is a word of scorn, a word of hate, but also a word about belief. I am a tourist here. A tourist trapped in a local’s body, engaging languages and experiences I do not know, as well as some that I do. I ask for forgiveness rather than permission. I am, after all, the goyest cracker on the platter, or so it would seem. But the contradictions and intersections of heritage, of race, the gravity and violence and folly of identity, spare no one. But it is as a person of faith—as a skeptical person of faith—that I have been torn and fascinated by the ways that belief undermines faith for individuals, and the ways belief has become a central destructive force of our time. Belief in tribal / racial supremacy, belief in religious exclusivism, un-belief in science and climate change, belief in conspiracy theories, belief in (more or less) charismatic leaders who promise the world, just rendered upside down. Conspiracy theories in particular preoccupy me. They have become a fixation, though not in the usual ways. Belief is inherently a creative act. And it’s quite possible that in todays Conspiracy Industrial Carnival we’re seeing the birth pangs of a new religion, the world’s first digitally mediated one. It is chaotic and protean still, but it is starting to serve some of the basic functions of traditional religions, of identity and community building, of sorting the universe out, of explaining the world. And, strikingly, forms of fundamentalism have emerged already. Resistance to any lines of questioning which undermine the accepted narrative, hostility to any who offer these questions, dehumanizing those who disagree (we are sheep led by shape-shifting alien reptiods), utter lack of humor, and, most insidiously, about fundamentalism of any sort, is the systematic suffocation of curiosity that fundamentalism expresses. I indulge a wide variety of ways for people to engage the world, mediated through belief or not. But the destructive nature of most of these conspiracy beliefs, amplified today by turbocharged media, with their endgame of despair; there is nothing good in them. The traction they have in the neo-fascist movements in the West is only matched by their tenacity in the Islamic world. Fabricated for ceramic artist Bruce Sherman, incorporating ceramic slabs into the table tops. 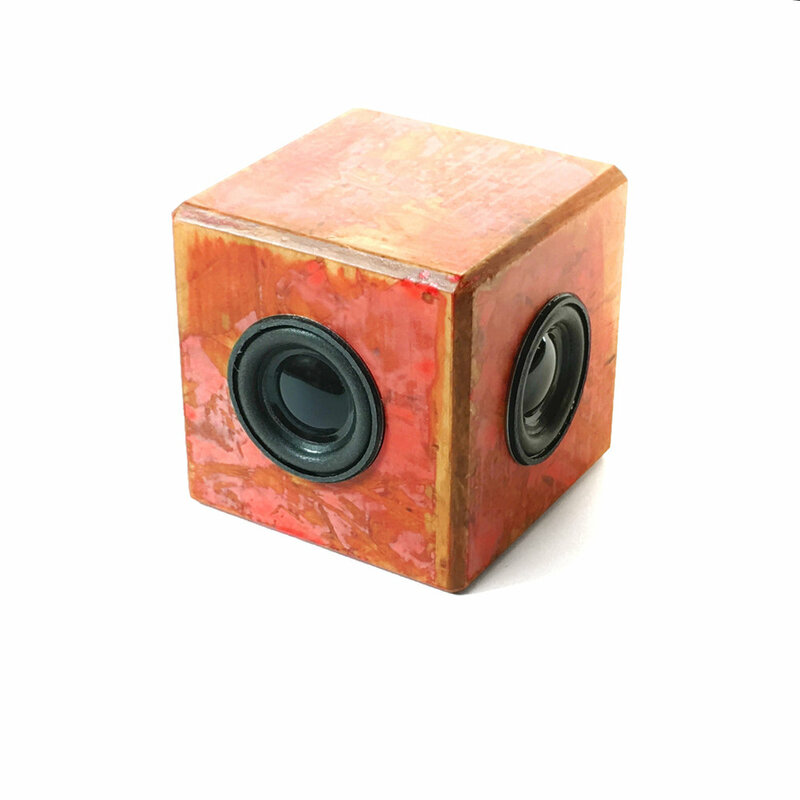 On-of-a-kind 3" cubes fabricated from etched Purkinje Board. Compatible with iPhone and Android platforms. Comes with USB charging cord. Call or write for availability or quantity purchases.